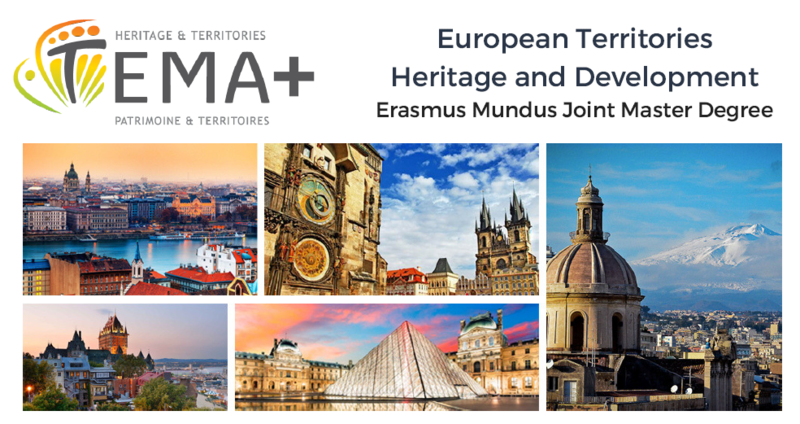 The application for the TEMA+ European Territories: Heritage and Development EMJMD with an Erasmus Mundus scholarship is still open until the 31st of March 2018. Do you speak English and French? Do you want to learn more about European Cultural Heritage in Budapest, Prague, Paris, Catania or Québec with the prestigious Erasmus Mundus scholarship (including a 1000 euros monthly allowance? Apply today and become an expert of Cultural Heritage: www.mastertema.eu #EuropeForCulture. The 2 year-long (120 ECTS) TEMA+ European Territories: Heritage and Development Erasmus Mundus Joint Master Degree programme proposes the analysis of the growing presence and importance of cultural heritage in a European context by applying a multinational, interdisciplinary approach and critical-analytical interpretation that none of the existing Masters degree in cultural heritage can offer. The Master Course is offered by a consortium of the following universities: Eötvös Loránd University of Budapest, Hungary, École des Hautes Études en Sciences Sociales of Paris, France, University of Catania, Italy, Charles University of Prague, Czech Republic, University of Laval of Québec, Canada in cooperation with the European Heritage Label (EHL) and different UNESCO organs. To apply for the TEMA+ Erasmus Mundus Master Course students must hold a degree in one or more of the following levels (BA/BSc /180 ECTS/ or MA/MSc/120 ECTS) and disciplines in History, Geography, Philosophy, Anthropology, Ethnography, Sociology, Cultural Studies, Urban Studies, Nationalism Studies, International Relations, Law, Economy, Architecture, Administration or related fields. The selection is based on academic excellence and proficiency in English and in French which are the languages of instruction. The students are required to study at least at two partner universities, with a common core Semester 1 at Eötvös Loránd University (ELTE), and with a specialised mobility track at one of the four partner universities during the following semesters (Semester 2-3-4). The consortium awards TEMA+ graduates with double or multiple degrees (depending on the student's mobility track), all accredited on national level, as well as a diploma supplement, allowing them to enter into the professions in the area of European Heritage in local, regional, national and territorial administration, in urban planning and research institutions, related to heritage and identity. The Erasmus Mundus (Erasmus+) programme offers a scholarship to excellent Programme and Partner Country students that consists of a contribution to the students' participation costs (including the tuition fees,for Erasmus Mundus scholarships, and June 17, 2018 for self-paying students. library and laboratory costs, full insurance coverage and any other mandatory costs related to the students' participation in the programme); a contribution to student travel and installation costs; and a monthly subsistence allowance of a 1000€ for the entire duration of the study programme. The application deadline is March 31, 2018 for Erasmus Mundus scholarships, and June 17, 2018 for self-paying students.